The start of a new war? A bunch of returning actors?! A Zyuranger tribute saved for the next-to-last episode?!! Speaking on behalf of that last point, it’s about damn time! Kaizoku Sentai Go-Kaiger Ep.46 Raw (Links): Turning Hearts, and Burning Ninjas! Author M.F. CalhounPosted on January 15, 2012 Categories MC's postsTags ep46, episode 46, Kaizoku Sentai Go-kaiger, Kakuranger, link, Ninjaman, raw, tribute episode, videoLeave a comment on Kaizoku Sentai Go-Kaiger Ep.46 Raw (Links): Turning Hearts, and Burning Ninjas! Kaizoku Sentai Go-Kaiger Ep.45 SUB: Nanja? Gokai Ninja! So, it looks like Ninjaman’s going to be hanging out with them for a while, what could go wrong? The real concern, what’s wrong with Don and Gai in the next episode?! Author M.F. CalhounPosted on January 11, 2012 Categories MC's postsTags ep45, episode 45, full, Kaizoku Sentai Go-kaiger, Kakuranger, Ninjaman, sub, subbed, tribute episode, videoLeave a comment on Kaizoku Sentai Go-Kaiger Ep.45 SUB: Nanja? Gokai Ninja! Go-Kaiger Ep.45 RAW: Ninjaman! Kenzan! Yep, two-parter. And it looks like it will be resolved when they figure out what’s wrong with Don and Gai! Author M.F. CalhounPosted on January 8, 2012 Categories MC's postsTags ep45, episode 45, full, Kaizoku Sentai Go-kaiger, Kakuranger, Ninjaman, raw, tribute episode, videoLeave a comment on Go-Kaiger Ep.45 RAW: Ninjaman! Kenzan! Ninjaman Returns?! : What does the jar reveal? There was actually a great battle with many of the Sentai giant robots against the Zangyack’s fleet. The robots were destroyed/defeated and that’s where the movie picks up from at the start. Ninjaman and Datas probably fought in the giant battle but ended up becoming inoperable/unable to fight. Note it is possible that Ninjaman was sealed back in the jar following the events of the legend war. Ohranger’s Gunmajin may have fought, but since he is so fickle, maybe not (laughs). Zuban survived that battle and that’s why he was still fighting in the war in what we see in the movie. In the movie, we’re only told Gokaiger takes place “a few years later” but it’s approximately 3 years. The only hint of that in the movie is Nozomu’s school uniform indicating he is in Grade 8 now. So then, did Domon send them out to protect the Megakure shrine knowing that the jar was there? And if that really is Ninjaman’s jar, does that mean that Ninjaman is the key to gaining Kakuranger‘s Grand Power? And if so, then what about the persistent rumors that the original Ninjaman suit is lost? Supposedly, there was only one suit made, and when Toei lended it to Saban for MMPR season 3, Saban lost the suit. Not sure if I believe that rumor, mostly because they would have had to make several suits for stunts and back-ups anyway. But they’ve been floating around for a while, so there. Also worth noting for those of you unfamiliar with Kakuranger mythos, the reason Ninjaman was sealed away in the jar was because he was fooled by Daimaou into attacking humans, and was sealed away as punishment. Author M.F. CalhounPosted on November 28, 2011 November 28, 2011 Categories MC's postsTags Grand Power, info, jar, Kaizoku Sentai Go-kaiger, Kakuranger, last episode, Ninjaman, rumors, screenshots, speculation, tribute episodeLeave a comment on Ninjaman Returns?! : What does the jar reveal? And something about that jar they showed near the end definitely looked familiar. Could it be the same jar that houses a certain big blue ally to the Kakurangers known as Ninjaman? Guess we’ll find out soon enough. Go-Kaiger Ep.40: Go-Kai Over Time and Space! Yep, this episode’s full of surprises (to say the least). And that is certainly an interesting jar that’s contained in that shrine. Wonder what it could be? Author M.F. CalhounPosted on November 27, 2011 Categories MC's postsTags ep40, episode 40, full, Goseiger Vs. Shinkenger, Kaizoku Sentai Go-kaiger, raw, Timeranger, tribute episode, video2 Comments on Go-Kaiger Ep.40: Go-Kai Over Time and Space! Kaizoku Sentai Go-Kaiger Ep.39 Sub: Mega-Charged School Day! Well, admittedly, this one was rather slow. But next week’s should be exciting, because it’s the Timeranger tribute episode where they travel back in time to the Goseiger Vs. Shinkenger battle! Can’t wait! Author M.F. CalhounPosted on November 21, 2011 Categories MC's postsTags ep39, episode 39, full, Kaizoku Sentai Go-kaiger, Megaranger, sub, subbed, tribute episode, videoLeave a comment on Kaizoku Sentai Go-Kaiger Ep.39 Sub: Mega-Charged School Day! Go-Kaiger November Episode Summaries and Future Tribute Episode Rumors. Joe, becoming GokaiBlue, fights Barizorg, while the other Gokaiger take on the Dogormin. However, Walz Gil appears at the battle… Furthermore, the Strongest Decisive Battle Machine, Great Walz, flies out from the Gigant Horse. In the Gokaiger’s greatest pinch Marvelous is…. Having toppled the Gokaiger, Walz Gil begins his Complete Invasion plan. This time, will the Earth become just another possession of Zangyack? What is the fate of Joe and Barizorg’s connection? And Marvelous is….? Stand up, Young Space Pirates! Defeat Wals Gil with your strong, burning bonds! Side note: Marvelous is surrounded by ??? in the 37 to 38 summaries, because he is going to have a dream talk with one AkaRed. Because of Navi’s Otakara Navigate, the Gokaiger head to Moroboshi High School. Gai informs the others that Moroboshi High is the school that the Denji Sentai Megaranger attended. However, it has been more than 10 years since they were here. From beyond space and time, from the future of the 31st century, a Video Letter reaches the Gokaiger. The Sender? Timeranger’s TimeYellow, Domon. He informs the Gokaiger they must time travel back to “October 2, 2010 A.D.” If they go there, a certain great power may be able to be attained…. Pay attention to this episode full of surprises! Side Note: It is confirmed that Agent no Metal Alice, Short no ZanKT 0, and Hone no Shitari appear in episode 40. Not only will this episode serve as an explanation for the Gokaiger’s appearance in the previous VS movie, but it will also probably be the first chronological appearance of Matrintis (ZanKT 0 being a prototype for the ZanKT Matroids), and maybe explain some stuff about Chimatsuri no Buredoran! Battle Fever and Denjiman’s powers are more than likely being saved for the Gavan movie, while Kakuranger’s tribute ep will follow the ep with Marvelous’ public execution. There’s rumors that the Kakurangers are involved in his escape (episode 43-44). Episode 45 is titled “Resurrection Balzion” (TBA). It involves Ackdos Gil creating a new Balzion and sending it to Earth to challenge KanzenGokaiOh. The Gokaiger require Bioman’s Ultimate Power to fight the Anti-Bio Particles. Gou Shirou, former RedOne, shows up to train the Gokaiger and give them the Bioman’s power. BioHunter Silva will not appear, because his voice actor, Hayashi Kazuo, was unavailable. Instead, Action Commander AquaMesser will pilot Balzion. Episode 46 is the would be Fiveman tribute episode, whether or not Basco has stolen this power is unknown. If Basco ends up as the final villain, the Emperor may not be around for too long. According to rumors it seems there might be a JAKQ episode in there somewhere as well, apparently has Ackdos Gil reviving Atomic Witch, a former enemy of JAKQ. Bamba Soukichi, former Big One, appears on Sky Ace to help the Gokaiger. Meanwhile, Luka looses her Ranger Key in the episode, making the rangers unable to use Big Bomber. The JAKQ Covack is ineffective. The episode will be a Luka focus. The Gokaiger pull out every trump card they can think of, but they cannot beat Ackdos Gil. The Emperor summons his forces to Earth, and starts a full scale attack. Seeing the numbers they face, the Gokaiger loose heart, especially since the Ranger Keys had returned to their rightful owners. Just then, Akaranger, Kaijou Tsuyoshi, appears! The Gokaiger are joined by the 34 Super Sentai with Akaranger, and regain their will to fight. The Second Legend War begins, and the battle goes to the Super Sentai. The Emperor is betrayed by Damaras, who kills him. 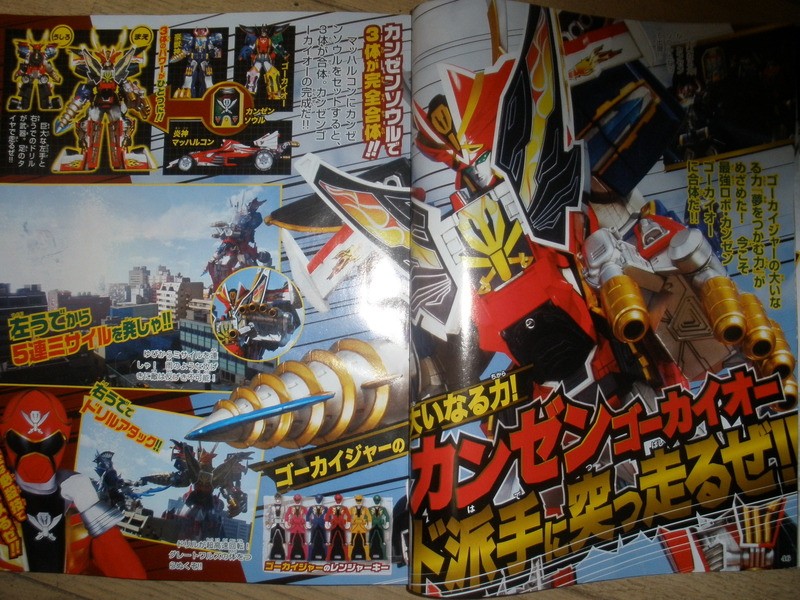 Damaras, who had killed Akudos Gil, makes himself the new Zangyack Emperor, and declares war on the Super Sentai. Damaras descends to Earth, giving the Gokaiger a lot of trouble with his tremendous power. The Gokaiger beat Damaras with a combination of the GalleonBuster and the Legend Dream, Damaras having been away from battle so long wasn’t up to the challenge. Just what is the Greatest Universal Treasure?! A second Legend War? Damaras as Emperor? And will the combined efforts of all 35 Super Sentais be enough to save the world?!! We’ll have to see how this turns. Author M.F. CalhounPosted on October 30, 2011 October 30, 2011 Categories MC's postsTags Ackdos Gil, Bioman, episode summaries, Fiveman, Great Waltz, JAKQ, Kaizoku Sentai Go-kaiger, Kanzen Go-KaiOh, Megaranger, rumors, Second Legend War, Timeranger, tribute episode, Walz Gil3 Comments on Go-Kaiger November Episode Summaries and Future Tribute Episode Rumors. Go-Kaiger Ep.36 Raw: Engine Aibo Speeding Away! So, a new ally, but new challenges on the way in the next episode. Will they be able to withstand this new Zangyack weapon? Tune in next week to find out! Author M.F. CalhounPosted on October 30, 2011 Categories MC's postsTags Engine Machalcon, ep36, episode 36, full, go-kaiger, Go-Onger, raw, tribute episode, videoLeave a comment on Go-Kaiger Ep.36 Raw: Engine Aibo Speeding Away!